The global market for shavers has been witnessing a significant rise in its valuation since the recent past, thanks to the increased focus of consumers on personal grooming. Nowadays, people across the world are more concerned about not just their face but their overall physical appearance, owing to which, they are prompted to shave body hair. The rising awareness pertaining to personal cleanliness and hygiene also has a remarkable contribution to this, which is reflecting greatly on the demand for various shaving products, leading to a substantial growth of the market for shavers, globally. The escalating disposable income of consumers, enabling them to spend on expensive products, has been an important factor behind this phenomenal rise of this market and is expected to continue to aid the market over the forthcoming years. Females in developed countries have also surfaced as prominent consumers of shavers, which is also projected to influence the market further in the near future. However, the disinterest for personal grooming and the lack of knowledge concerning personal hygiene among women in emerging economies may affect the market’s progress to some extent over the next few years. In 2015, the global market for shavers was worth US$46.38 bn. Rising at a healthy CAGR of 4.80% between 2016 and 2024, the opportunity in this market is likely to increase to US$70.24 bn by the end of 2024. Electric and non-electric are the two main varieties of shavers available in the global market. Due to their user-friendly features and non-dependence on electricity or battery for operations, non-electric shavers have been more popular among consumers. In 2015, the non-electric shavers segment led this market with a share of 76.5%. Analysts project the segment to continue its leading steak over the next few years. Electric shavers, on the other hand, is exhibiting significant potential for future growth on the grounds of the increasing awareness among consumers pertaining to their efficiency. General merchandising/mass stores, health and beauty stores, and supermarkets and hypermarkets are the key distribution channels of shavers across the world. As supermarkets and hypermarkets witness a relatively higher footfall and sell products in large quantities, they hold the most prominent share in the global market for shavers and are anticipated to retain their dominance over the forthcoming years. North America, Latin America, the Middle East, Europe, Africa, and Asia Pacific have surfaced as the prime regional segments of the worldwide market for shavers. Europe led this market with a share of nearly 43% in 2015. Thanks to the economic recovery in this region, which is instilling confidence among consumers to again shift to system razors and electric shavers, the Europe market for shavers is likely to continue on top in the years to come. Among other regional markets, Asia Pacific and Latin America are expected to exhibit promising opportunities for growth in the near future, thanks to the rising urbanization and increase in consumers’ purchasing power. Some of the leading players functional in the global market for shavers are Panasonic Corp., Koninklijke Philips N.V., Energizer Holdings Inc., Conair Corp., The Procter & Gamble Co., Spectrum Brands Holdings Inc., Super-Max Group, Wahl Clipper Corp., and SOCIÉTÉ BIC. Shavers market has shown significant growth over the years owing to the rising need of removing facial hair among the male population. Rising consciousness towards personal grooming and increasing preferences towards shaving products for removing body hair are triggering the growth of the global shavers market. The market for shavers market is mainly driven by the consciousness towards personal grooming, increase in female shaving products and transition in focus from facial hair removal to body shaving among the male population. In recent year’s population from both the genders are inclined towards personal grooming. Consumers have shown inclination towards shaving body hair such as chest hair, arm pits, legs and arms. Increasing acceptance of spending on personal care products among men is also resulting towards the positive impact upon the global shavers market. Further, the rising purchasing power of the consumers residing in the developing countries is another major factor that is fueling the growth of the shavers market. Additionally, increasing endorsements by celebrities for shaving products has also urged the population to opt for shaving products as well. Thus, the impact of this driver is medium at present and the same is expected to be high by the end of the forecast period. The shavers market is also driven by the increasing demand for shaving products among the female population. Few factors include rising female workforce, and increasing awareness about hygiene among others. Currently, females have become more conscious about their outlook and removal of body hair is one of the prime concerns among the population. Females are also driven towards removing their body hair due to societal and/or media pressure. Peer pressure is another major factor that has led this population towards shaving. Further, exposure towards varieties of shaving products for females by way of advertising through television and print media among others is another major factor that has led females towards the purchase of shaving products, which in turn has shown a positive impact on the growth of the shavers market. The impact of this driver is expected to strengthen by the end of the forecast period. On the other hand, weak female target audience coupled with high prices of electric shavers is restraining the global shavers market in recent years. Females are targeted as a lucrative segment but exposure regarding the usages of shaving products is weak in the developing countries thus restraining the global shavers market. Electric shavers are relatively expensive compared to their non-electric counterparts. Due to this, the penetration rate of such products are very less since majority of the consumers refrain themselves from purchasing such products. Moreover, adoption of greener alternatives is generating opportunities to the global shavers market. Increasing awareness towards protecting the environment, recyclable razors and electric shavers are preferred and are thus generating opportunities to the global shavers market. By different product type the market of global shavers has been segmented into electric shavers and non-electric shavers. Non electric shavers dominated the market over the years due their low price compared to the electric shavers. The market has been further segmented by end use and distribution channel. By end use the global shavers market has been segmented into male and female. Shavers used by male dominated the market in 2015 as it is considered as an essential necessity, although women are also considered as a lucrative target audience for the manufacturers in recent years for the shaving products. By distribution channel the shavers market has been segmented into health and beauty stores, general merchandising or mass stores, super markets and hyper markets and others. 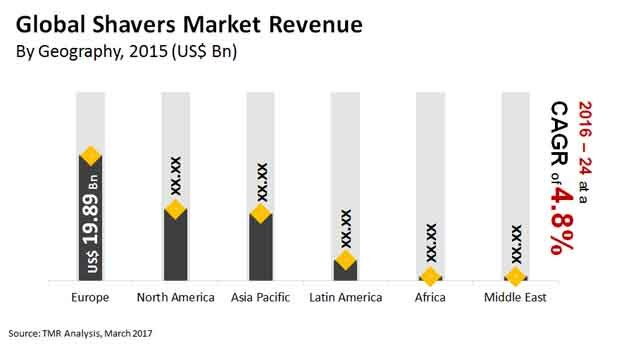 Super Markets and Hyper Markets dominated the global shavers market in 2015. By geography the global shavers has been segmented into North America, Europe, Asia Pacific, Middle East and Africa and Latin America. Europe dominated the both electric shavers and non-electric shavers. Asia Pacific showed the fastest growth in 2015 for the global shavers market.